Dubbed as �Dargah Diplomacy�, Pakistan President Asif Ali Zardari�s day-long private visit to India today to offer prayers at the Ajmer Sharif did help the two South Asian neighbours reduce mutual tension and consider practical ways to speedily settle some of the less contentious issues such as Sir Creek and Siachen. Pakistan President Asif Ali Zardari today offered prayers at the historic 13th century dargah of Sufi saint Khwaja Moinuddin Chisti in this pilgrim town after which a $1 million donation for the shrine was announced. 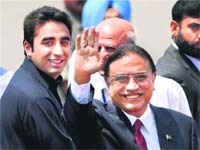 Can Rahul, Bilawal hit it off like their parents? 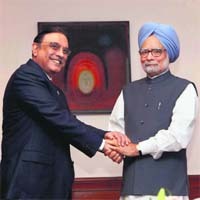 China today lauded Pakistan President Asif Ali Zardari's visit to India, saying better ties between the two nuclear-armed neighbours would benefit both countries and bring stability in the region. The efforts of Mehboob Elahi, a former Indian spy who had once stayed with Pakistani President Asif Ali Zardari in the Karachi Central Jail, to meet Zardari today in New Delhi didn�t bear fruit. He wanted to raise the issue of Indian prisoners of war (POW) in Pakistan. The spectre of communal conflagration returned to haunt Hyderabad today. After a gap of over two years, the police imposed an indefinite curfew in several areas of the sensitive old city following communal violence. "I am back," said Vijender while speaking from Astana as the Bhiwani (Haryana) boxer booked a berth for London Olympics, reaching the semifinals of the Asian Olympic Qualifiers in Astana, Kazakhstan today. In a new twist to BJD MLA Jhina Hikaka's hostage crisis in Odisha, Maoists today purportedly issued a fresh communication asking his wife to reach a village in Koraput district on April 10 along with 30 prisoners to pave way for the legislator's release. The letter, released to a section of the media by Andhra Odisha Border Special Zonal Committee of the Maoists, asked Hikaka's wife Kaushalya to reach Balipeta in Naxal-hit Narayanpatna area.